Recently I have been having a difficult time because everyone knows that I am about to graduate from seminary and they keep asking me what I am going to do when I graduate. No one wants to hear the truth, which is that I don’t know. They are asking me about a future that I do not feel qualified to talk about. I do not suppose that I can see what is coming up around that corner in the life of the person who I may become anymore than I can see around the corner of a building or can see what is going on in Istanbul at this moment. But I am not new here. I know that most of us live in anticipation of the future and everything that we do in the present is primarily focused on securing a place in some future. Even when we are trying to “get into heaven” we are trying to do work to ensure some particular future. But the fact is that if we are focusing on the future–or even the past–then we drain all of the life out of the present moment. There is no life in the future. Life is eternally now. Yet, knowing this, I cannot seem to figure out how to convey to people that I see this kind of wants for the future talk or regrets of the past as a denial of God’s reality. In my consciousness and experience everything always works out in ways that I could never have imagined or predicted in the first place, so I might as well not worry about it too much. Sometimes I am blessed to see some of what is coming but I still have to take steps in my present awareness of reality. And besides, when I get to the”future” that I thought I saw, I always see new things that I could not see from the “past” so in that regard the future I anticipated still changes and my prophecy fails. So why get too much into it? 25 “Therefore I tell you, do not worry about your life, what you will eat or what you will drink, or about your body, what you will wear. Is not life more than food, and the body more than clothing? 26 Look at the birds of the air; they neither sow nor reap nor gather into barns, and yet your heavenly Father feeds them. Are you not of more value than they?27 And can any of you by worrying add a single hour to your span of life? 28 And why do you worry about clothing? Consider the lilies of the field, how they grow; they neither toil nor spin, 29 yet I tell you, even Solomon in all his glory was not clothed like one of these.30 But if God so clothes the grass of the field, which is alive today and tomorrow is thrown into the oven, will he not much more clothe you—you of little faith? 31 Therefore do not worry, saying, ‘What will we eat?’ or ‘What will we drink?’ or ‘What will we wear?’ 32 For it is the Gentiles who strive for all these things; and indeed your heavenly Father knows that you need all these things. 33 But strive first for the kingdom of God and his righteousness, and all these things will be given to you as well. 34 “So do not worry about tomorrow, for tomorrow will bring worries of its own. Today’s trouble is enough for today. The only time there ever is. If anyone ever asks what time it is, the only truly accurate answer that anyone can ever give is NOW! The time is now. 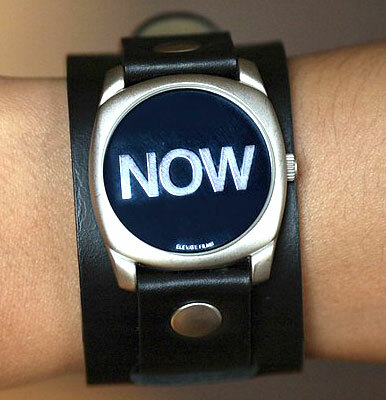 There is no time outside of now. In God everything that is is being now. God is eternal indivisible being. How does that resonate with you? Do you get what I am saying? God is Wholly One eternally now. God is not in the past or in the future. God is right now and the only “time” we can commune with God and experience the fullness of who God is or who we are in God or who anyone else is is right now. NOW. NOW. NOW. This is why in John 4:23,24 Jesus said, “But the hour is coming, and is now here, when the true worshipers will worship the Father in spirit and truth, for the Father seeks such as these to worship Him. God is spirit, and those who worship him must worship in spirit and truth.” The Truth of the Spirit is that outside of now, we can never know anything about ourselves and we especially cannot know anything about God. Anything that tells us of a reality outside of the Now of God is a lie and a distortion of reality. Knowing this, I do not like hedging my bets on my ability to forecast my future. Now for some of you who might get exactly what I am saying, you may be wondering what you should do when people ask you about the future. The truth is that I wish I had an answer, but the fact is that I don’t. All I can suggest at this point is that you do your best to communicate what you are aware of at the present moment. And if things turn out differently than you surmised–as they often do–forgive yourself and those who may be disappointed for investing so much energy into a lie. That’s what I try to do. If that doesn’t ease the sting, cry about it. I also find some comfort in that. But most importantly, try to cultivate your ability to be mindful in the moment and try to stick with the Present no matter how tempting it is to zone out and try to time travel (see blog post on why time traveling is never a good idea). The fact is that there is no true comfort in the past or the future. Getting caught up in the illusion of time is like being on drugs. Going into the past is like getting “stoned” and going into the future is like getting “high”. And just like those words imply, when we are stoned it keeps us tethered to the past making the present too heavy to deal with and when the high of the future wears off, we crash and we find ourselves disappointed and too exhausted to deal with the realities of the present. It’s just not worth it. Believe me. I’m going through time detox right now. When you are addicted to time illusion, you start to feel like you never have enough? But ironically, when you stay in the present there is always more than enough. In fact there is eternity.